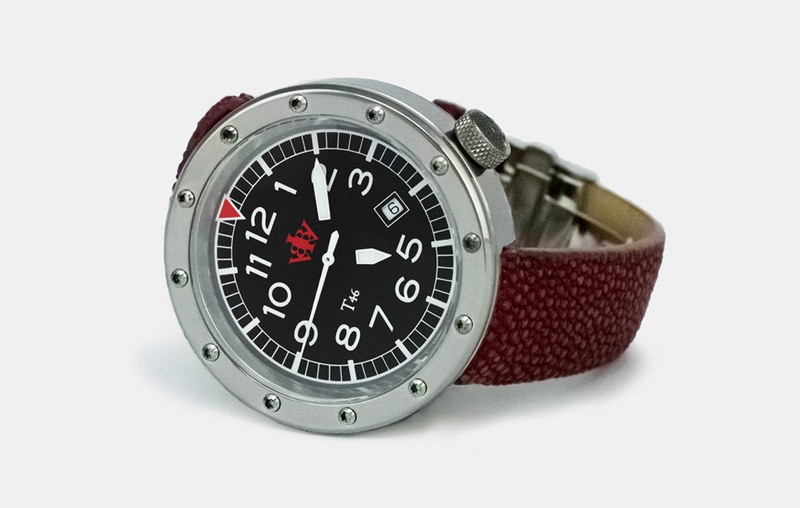 THE MODEL – The V2 represents a subtly updated T46, The Variant 2. As before, the “T” indicates it is the TOOL WATCH and the 46 indicates the case size. The case has grown slightly to 46.3mm vs 46.0mm; the height remains the same at 13.0mm. The two-piece case is still closed with a miniature bolt circle that has been slightly expanded to permit an axial “O” ring gasket, and larger engraving. All the fasteners are proprietary, enhancing the unique look of the watch. The case is machined on a CNC lathe and milled from a solid bar stock. The lug pockets holding the strap have been slightly enlarged and are internal to the case. The result is a reduced foot print on the wrist, making an otherwise large 46.3mm case appear trim and compact. The back permits viewing of the movement and rotor through a crystal window. This allows you to see the heart of the watch. 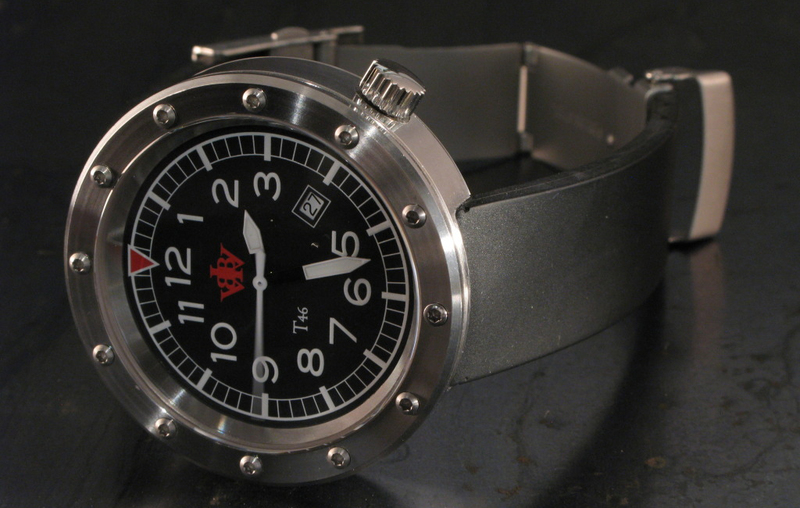 Wrist Size Choose an option… REG 6-1/4” to 8-1/4"
THE CASE METAL – is 316 Stainless Steel with a high polish surface. THE MOVEMENT – is an automatic (self-winding) ETA 2824-2 and the date is @4:00. It is Swiss, made with 25 jewels and Incabloc Novodiac shock protection. This movement is a workhorse and the movement of choice in many luxury watches selling at a much higher price point. 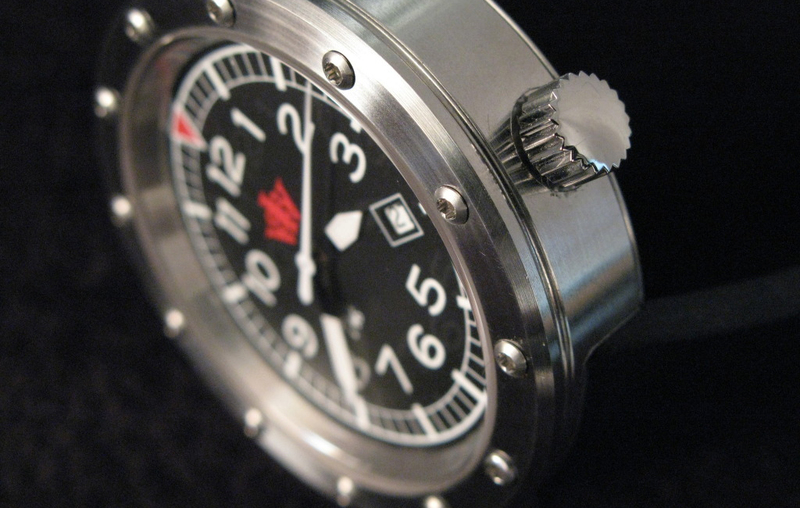 The daily rate tolerance for the watch is +/- 12-15 seconds a day. While you may have a daily rate less than this, this tolerance is what ETA has established. PLUS UPGRADE MOVEMENT – includes heat blued screws and the rotor has the Cotes de Geneva (Geneva Stripes), and the plates are more highly polished. Just an observation: It is rare that this upgrade is made for any online purchase, it is equally rare that it is NOT made with any purchase made in person at our shop. The visual appeal for this seemingly simple enhancement is captivating. 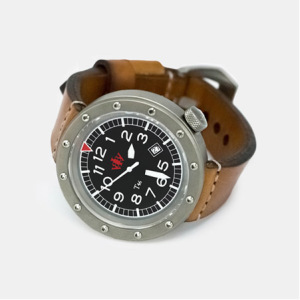 THE WATER RESISTANCE – 10ATM (100 meters) or 333 feet. 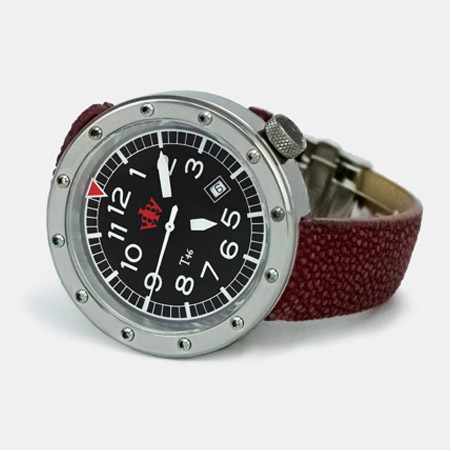 THE DIAL – is matte black with luminous Arabic numerals, the T46 model designation and the Berkbinder & Brown logo in red. 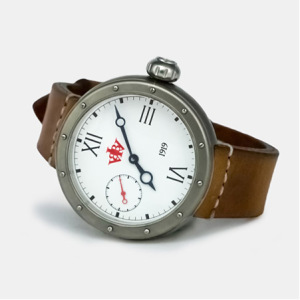 It was designed with a simple straight forward look making the dial easy to read. THE HANDS – are simple with luminescent treatment for easy reading in low light environments. THE SWEEP HAND – is prominent and readable. THE CROWN – is a proprietary screw down type, the logo is raised on the top and is located at 4:00. The crown is larger allowing easy manipulation. The offset at 4:00 will not create any discomfort or interfere with the back of the wrist. THE CRYSTALS – The front crystal is a domed thick durable 3mm Sapphire Glass for the face and 2mm Sapphire Glass for the exhibition back, allowing full view of the movement. THE BEZEL SCREWS – are a proprietary and have a 6 pointed socket, made from 316 stainless steel for all cases. The screws protect the crystal and add to the aesthetic of the watch. THE STRAP – black Horween Chromexcell strap with white stitching. The buckle is brushed stainless steel with a machined prong and screw in pin. The strap is held in place by spring bars.